Today’s host(s): Scot Landry and Fr. Chris O’Connor. Today’s guest(s): Dom Bettinelli and George Martell of Pilot New Media, reporting live from Madrid. Summary of today’s show: Scot and Fr. Chris discuss the events pilgrims for the Archdiocese of Boston have attended so far at World Youth Day with Dom Bettinelli and George Martell. 1st segment: Scot welcomed Fr. Chris back to the show, as it has been a few weeks since they have been on the air together. Fr. Chris described his travels with family to Rome – even that he did the same tour of Rome twice with two groups. He said it was great to return to the tomb of Blessed John Paul II at the Vatican and celebrate Mass at the tomb. Fr. Chris also said he climbed the cupola of the Basilica twice, distributing the blisters evenly across both sides of his feet. He continued and described his further trip to Holland. Fr. Chris asked Scot about his vacation. Scot detailed that he and his family visited relatives in Seattle, and that he enjoyed the outdoors and the greeness of the Pacific Northwest. The family visited two great waterfalls and climbed part of Mt. Rainier, and the temperatures were in the low 70s and comfortable. Scot said visiting the Space Needle and attending a Mariners game were highlights of the trip as well. Scot said another highlight was taking his family to a different church for three Sundays in a row. He said it was a great teaching experience for his children about the universality of the Catholic church, even when small details like songs or holding hands during the Our Father are different. 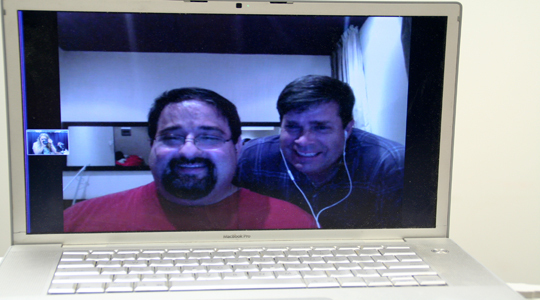 2nd segment: Scot welcomed Dom Bettinelli and George Martell live from Madrid via Skype. Dom explained that although it was 35 degrees (which sounds like parka weather), it was in Celsius – temperatures have been between 95 and 100 degrees in Madrid so far. Dom and George said there were almost 500 total pilgrims from the Archdiocese. About 350 pilgrims are traveling with the official Office of New Evangelization team, and the rest are from various parishes throughout the Archdiocese and from Boston University. George said it was a lot of fun to experience World Youth Day firsthand and show the incredible experience that the youth are having through his pictures. Scot and Dom discussed that the vast majority of the pilgrims from the Boston area have probably not been outside the country before except possibly to Canada or the Caribbean – he said at some times it can be overwhelming for the pilgrims but group leaders help the youth overcome that. Scot remarked how much older European landmarks are – Dom replied that some of the everyday parish churches in Madrid are older than the United States itself! Fr. Chris observed that it must take a lot of planning to keep such a large group together and under control. Dom said the planning and management from the ONE team has been great and spot on. So, as you received Christ Jesus the Lord, walk in him, rooted in him and built upon him and established in the faith as you were taught, abounding in thanksgiving. Dom said that the overwhelming experiences of World Youth Day are the universality of the Church and also the youthfulness of the Church. He said none of the pilgrims in Madrid have any embarrassment about literally proclaiming their faith at the top of their lungs – a great example to many youth who are used to our culture here where that public enthusiasm about faith is discouraged. Scot asked George to describe what it was like to take photos in places with such rich history. George said it was hard to fathom and put into words the respect with which everything is cared for and what an awesome experience it was to have the opportunity to take pictures in the churches. Scot, George, and Dom discussed Cardinal Seán’s short lecture on the history of Toledo before a Mass there. Dom said Cardinal Seán told the pilgrims that Toledo was historically a place where Muslims, Christians, and Jews always got along – a city of unity. Dom said the town still has that peaceful feeling even today. 3rd segment: Scot asked George and Dom to describe the interactions that the Boston youth are having with the youth from all around the world. George reiterated that there is no shyness about faith in public – and that it was exciting to see the youth from Boston become more comfortable expressing themselves. He said he hopes this comfort will help them grow closer to God by the end of the week. Dom said that youth are encouraged to bring trinkets with them to trade, and that there is a very interesting bargaining going on between youth all over the world. He also said gear with American flags is very popular among the crowds. Both Dom and George remarked how easily the youth got along. Dom said in Toledo a group from Boston University started playing music outside the Cathedral, and were very quickly joined by a group from South Africa with tribal drums and singers from Sicily and New York – showing the true universality of the crowd. Scot asked Dom about the Boston group being able to pray with people from other countries. Dom said the prayer so far with other groups has been much more spontaneous so far, but there will be much more opportunity now that the official events of World Youth Day have begun. Dom said it was an amazing experience to see the people from Madrid gravitate towards the energy of the youth. Fr. Chris asked Dom to speak about the opening Mass for World Youth Day, which featured the Archbishop of Madrid, 800 other Archbishops and Cardinals, 8,000 priests, and 500,000 attendees. Dom explained that people who have been to a Papal Mass before would be familiar with the tight quarters but prayerful atmosphere of the opening Mass. He continued that even though you may not speak the same language as the person on your right or left, you still have the language of faith and the universal form of the Mass. He said the crowds would be like combining a Patriots victory parade and the Boston Pops 4th of July Concert at the Hatshell and closing Commonwealth Ave and Storrow Drive in Boston. Dom said a highlight of the Mass was the blessing of a reliquary of Blessed Pope John Paul II that contained some of his blood. Fr. Chris also noted the youth all got a religious medal with and many other items in a welcome backpack kit. 4th segment: Scot started the segment by noting that many of the priests of his generation point to a World Youth Day as a spark to their vocational call. Fr. Chris agreed, saying that World Youth Day can help people to see the need for the priesthood and to see that they are not alone – they have the support of many brothers and sisters across the world. Scot added that Spain, a previously very Catholic country, now has a population that is 25% atheist. Fr. Chris said Pope Benedict has said that Europe is afloat without roots, and must get back to Judeo-Christian principals if it is to survive. Scot asked Dom if the growing secularization was noticeable in Madrid. Dom said there have been some low-visibility small protests against government support of World Youth Day, as well as graffiti here and there. He said he thinks the secularization in that area seemed to be much like it is in the USA – less hostile and more apathetic. Scot explained the main reason Dom and George are in Madrid is to capture video, audio, and other media that can help people in Boston experience some of the pilgrimage to Madrid. Dom said their primary goal is to bring the people of the Archdiocese along with the pilgrimage virtually through the website, blog posts, pictures, Facebook posts and tweets. Dom went on to say that while there have been a few hiccups, the computer equipment they use is unique for a small group and has performed flawlessly to let them share experiences over the internet. Fr. Chris said he can’t wait for Pope Benedict to get to World Youth Day to see what messages he has for the youth gathered there. Dom said the differences between Blessed Pope John Paul II and Pope Benedict have been small but important – Pope Benedict emphasizes more silence and meditation and time for silent prayer, while Blessed Pope John Paul II seemed to emphasize the joyous (and sometimes loud) expressions of faith. Scot said that, in philosophical terms, Blessed Pope John Paul II was a phenomenologist and valued the event and experience nature of World Youth Day; whereas Pope Benedict sees his role as more like John the Baptist’s, pointing and leading towards Christ. Scot asked George to compare the experience of being a photojournalist in the United States with the experience he is having now taking photos at World Youth Day. George answered that the thing striking him the most is the overtly visual universality of the Church. George said one of his favorite photos so far was a young boy with his head back, yelling about his love for his faith. Fr. Chris agreed that the joy experienced is incredible on these types of pilgrimages. George said he looks forward to showing with pictures how the faith of the pilgrims will grow over the week. Scot said that up until the opening Mass a few hours ago, it’s been a “pregame” for World Youth Day. Dom said that over the new few days the youth from the Boston will attend several catachetical sessions, a “Theology on Tap” event, Stations of the Cross with Pope Benedict in the streets of Madrid, a Mass at the Basilica of St Francis, Eucharistic Adoration, and the closing Mass with the Pope on Sunday morning.